WTI crude prices are in the $47.75-$48.00/b range this morning. Prices strengthened for a time yesterday, peaking at a high of $48.40/b, before gradually declining. WTI opened at $47.98/b today, an increase of $0.58, or 1.22%, above yesterday’s opening price. Current prices are $47.87/b, a decrease of $0.30 below yesterday’s closing price. Diesel opened at $1.4609/gallon this morning. This was a modest increase of 0.15 cents (0.1%) above yesterday’s opening price. Current prices are $1.4619/gallon, down by 0.43 cents from yesterday’s closing price. Gasoline opened at $1.5288/gallon today, a decline of 1.02 cents, or 0.66%, from yesterday’s opening. Prices are $1.5337/gallon currently, a continued drop of 2.08 cents below yesterday’s close. Oil inventory movements are expected to be mixed this week, with crude inventories shrinking and product inventories growing. The API reportedly noted a larger-than-expected draw on crude inventories of 4.6 mmbbls, well above the Schneider Electric industry survey expectation of a 3.0-mmbbl drawdown. However, the API reported large additions to gasoline and diesel inventories. The API noted a 4.1-mmbbl addition to gasoline inventories, versus an industry expectation of 0.5 mmbbls. The API data also showed a 1.8-mmbbl addition to diesel stockpiles, versus the industry expectation of 1.0 mmbbls. The API data lent support to crude prices, but weakened product prices. The official data from the Energy Information Administration (EIA) will be released later today. Crude prices also are receiving support from continued tensions in the Middle East. Qatar remains isolated, though diplomatic missions are underway. Adding to regional tension, there were two attacks in Iran that reportedly targeted the Parliament and a shrine. 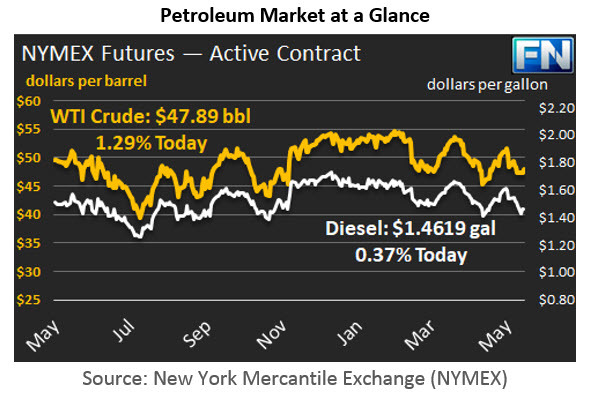 After falling for five trading sessions in a row, WTI crude and diesel opened higher this morning. Gasoline prices continued to decline, however, in part because of the potentially hefty stock build. Last week, the EIA reported a gasoline stock draw of 2.9 mmbbls, the largest drawdown in a four-week streak of inventory draws. If the current week shows a major stock build along the lines of the 4.1 mmbbls noted by the API, it may signal weak post-Memorial Day demand.